At the mouth of the Gamtoos River lies a stunning beach with a huge stretch of soft white sand, perfect for lengthy strolls. The scenic lagoon and river offer safe swimming, boating and canoeing. 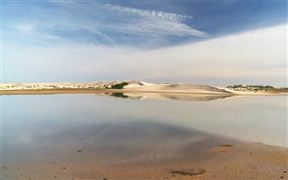 Gamtoos River Mouth is 2.5km from the centre of Gamtoos Mouth , the nearest airport 64km (Port Elizabeth Airport).